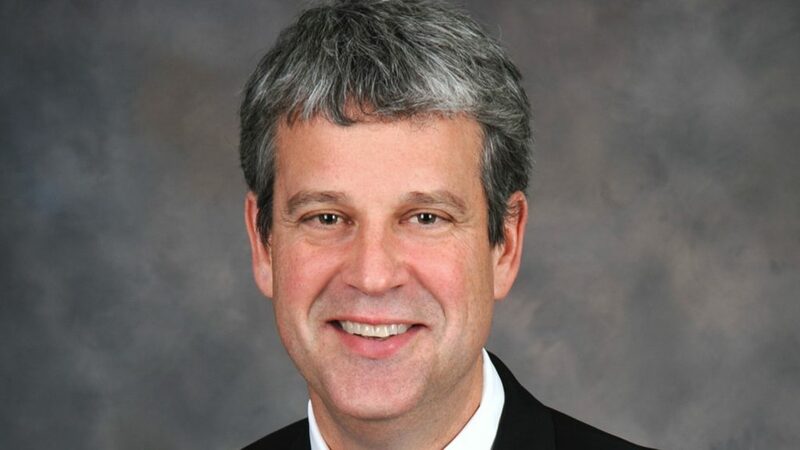 The first criteria NC State Chancellor Randy Woodson had for hiring a new men’s basketball coach was that he wanted someone who cared not just about the athletic ability and competitive success of the Wolfpack student-athletes, but also about the commitment to education he would enforce. 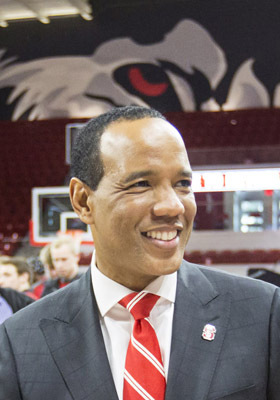 On Sunday, when Kevin Keatts was introduced as the next head coach of the Wolfpack at a Reynolds Coliseum press conference, Woodson was fully convinced that Keatts met his high standard. “What impressed me the most is his commitment to excellence in all aspects of these young men’s lives,” said the chancellor. “I said going into this that I wanted to make sure we had a coach that cared deeply and passionately about these guys’ success, in every facet of their lives. For athletics director Debbie Yow, who used the counsel of a hiring committee to make the selection, Keatts had what she calls “the stuff,” an intuition that she saw in other recent hires, such as men’s and women’s swimming coach Braden Holloway, wrestling coach Pat Popolizio, men’s soccer coach George Kiefer and women’s basketball coach Wes Moore. Since being hired by Yow, each of those coaches has taken over programs and moved them up in the national rankings of their respective sports. Yow is confident Keatts will develop his program the same way. Keatts, who spent the last three years as the head coach at UNC-Wilmington after stints as head coach at Hargrave Military Academy in Virginia and as an assistant at Louisville, is also a structured disciplinarian, who holds his players accountable for their decisions. “He’s clear and unforgiving and unrelenting in what he expects,” Yow said. “He sends a clear message: you will go to class, you will take your headphones off, you will do what you are asked. He’s clear about all of it. 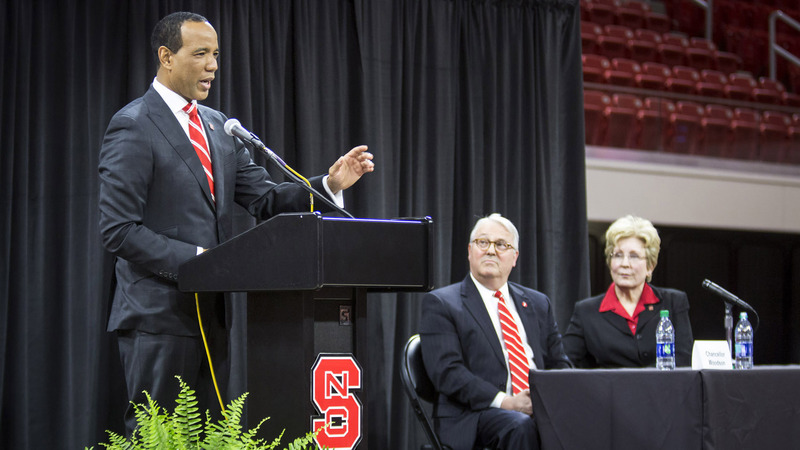 Keatts answered five questions about his new role as the head coach of the Wolfpack. What excites you about taking over this program, with its tradition of success in college basketball and in the Atlantic Coast Conference? This is a national championship program, so I consider this to be an unbelievable opportunity for me, something I don’t take for granted. I will work every day like it is my last day of work, that if I don’t do well, I have a chance to get fired. That’s the way I am going to build this program. I think it is important with players to build a relationship so they know you care about them. I want to show them that every day. I am going to be the first person in the office and the last person to leave. I will be the first person to the court. I told those guys, no matter what you are going through throughout the day, it’s important that when you walk between those lines, that you are focused on NC State basketball. If we can get everybody to play together, to play for NC State, that will go a long way. At the same time, I want our players to be part of the whole NC State community and for them to interact with the student body. A lot of times, when you play big-time college athletics, you isolate yourself from the community. I think it is important for our players to be a big part of that community. You mentioned several times that you want players to represent the name on the front of their jerseys, not the one on the back. What is your vision of making that happen? Probably the hardest question I had to answer in the interview process was what my vision for the program was. What I said was that I wanted to build a great program, not just a great team. I don’t want this to be a situation where we win one year and then aren’t successful for two or three years after that. I think it is important to lay a foundation for a program. That is something that will be gradually built, and I hope everybody has patience for that. What drew you to NC State? 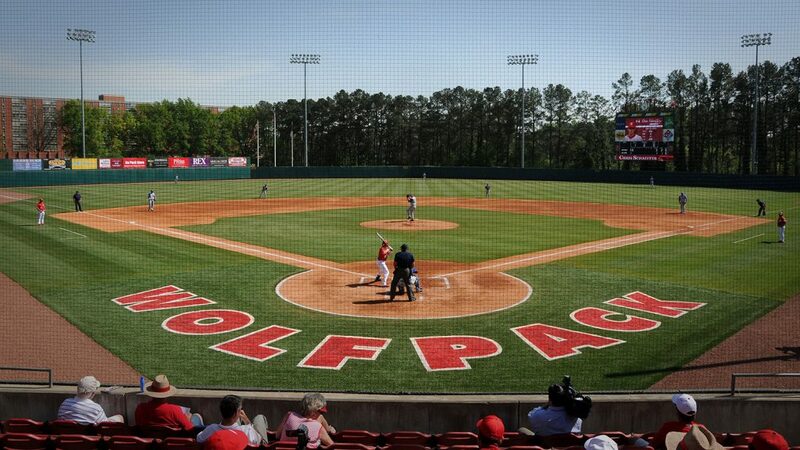 I’ve always loved NC State. I grew up in Lynchburg, Virginia, but I was never a Virginia fan. I’ve always been an ACC fan. Virginia Tech was in the Big East. The next closest school to me was NC State and I vaguely remember the [1983 team with Dereck Whittenburg], though I am much, much younger than Dereck. NC State basketball was always part of me growing up as a college basketball fan. I also believe NC State is a great place to get a degree. Raleigh is an unbelievable city. There is great academic and athletic tradition here. And we play in the best conference in the country. We have everything we need to bring players here to be successful. With PNC Arena, Reynolds Coliseum, the Dail Practice Facility, NC State has plenty of top-notch facilities in which to practice and play. What else do you need besides that and the other things you mentioned? In general, I think you need a commitment from the players. We need a commitment from those who create the atmosphere that NC State is a great place to go, not just as a basketball place. I think the experience of college is huge. I think our guys should be invested in coming here, not just to play basketball, but to take advantage of what the school has to offer. NC State has built its brand around “Think and Do”—working together to solve society’s biggest problems. How does that align with your vision of the program’s future? 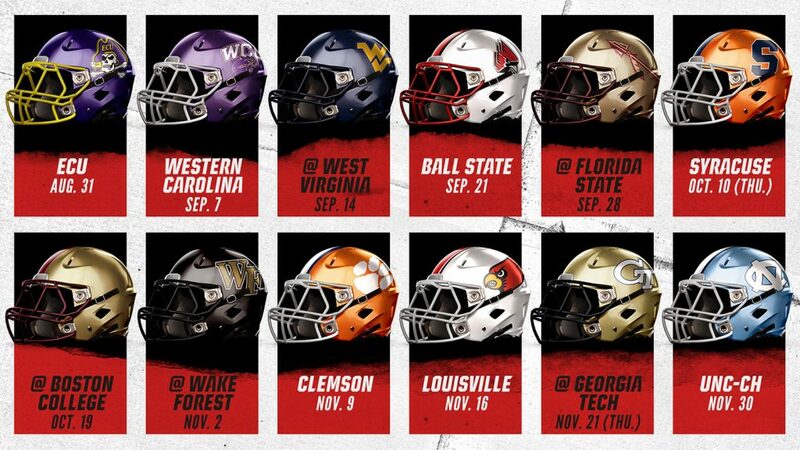 Well, we are taking over a program that won four [ACC] games last year. We have a lot of work in front of us. I think with the commitment from everybody we have received, the support of everybody on the athletics staff, the commitment of the chancellor’s office, I think we will get this program going. It’s going to take time. Everybody has to be involved with it. It won’t just happen from the work we do in the basketball office. A in-state hire with a winning tradition and top notch recruiter. It just does not get no better than this! I would not be the least bit surprised to see him return the Wolfpack to their winning ways and back to the NCAA tourney next season. This guy knows how to coach and win. Do not sell him short!!! For the love of God lets get to work and become the team that our fan base is starving for! Hoping that Coach Keatts is serious about STUDENT athletes. Winning is nice but integrity is essential. That he was an assistant at Louisville during the recruiting scandal is troubling. We NCSU graduates want to be proud of the teams that represent our great university. Get off your high horse Kendall, the man has no scandal affiliation with any other programs and was in no way directly implemented in the Louisville one. He is a man of great integrity. I’m guessing you were begging us to bring in that slimeball Calamari. ?? I’m not on any horse, high or otherwise. I simply said that I hope he is serious about what he says. Did you mean Calipari? If NCSU hired him or anyone dedicated to recruiting athletes who have no intention of being students, I would not be happy though that team won it all. I wish coach Keatts every success, including beating Louisville twice per year. Incidentally, I go back to Burleson and Thompson, graduating in 1972, when dinosaurs nested in the Riddick stands. Hoping that Coach Keatts is serious about academic success for STUDENT athletes. As an NCSU graduate, I want to be proud of the teams that represent our great university. Winning is nice, but integrity is essential. That he was an assistant at Louisville at the time of the recruiting scandal is troubling. I grew up across the railroad tracks from NC State and experienced both basketball championships living there. I really think this is the best basketball hire since Jimmy v.
Looking forward to being a proud fan of Wolfpack basketball again! Wish Coach Ketts the best!